Have just spent a wonderful but busy few days in Great Malvern and Worcester finalizing arrangements for the launch of the Water Doctor’s Daughters on March 23rd. 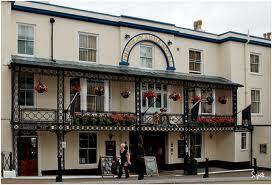 It’s to be held at 2.00pm in the spacious Morgan Bar at Malvern’s historic Foley Arms Hotel. I will be giving an author talk before signing copies of the book. My friend, local historian Cora Weaver, will also speak. There will be some light refreshments and everyone is welcome. There are many prints and cartoons in the hotel’s main lounge depicting the rather eccentric 19thC water-cure treatments provided by Dr James Loftus Marsden and his colleagues. 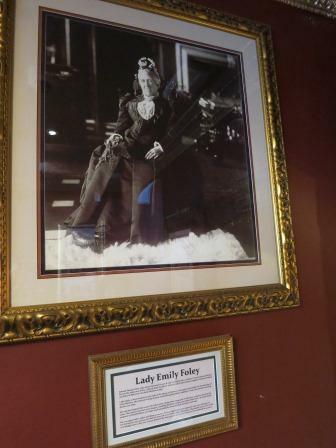 And in the foyer is a portrait of the imperious Lady Emily Foley. As Lady of the Manor she approved the Rev. John Rashdall’s appointment as vicar of the Priory Church in 1850. Rashdall was the Marsden girls’ maternal uncle. It was he who travelled to Paris when rumours arose that the children were being mistreated by their governess, Mlle Doudet. 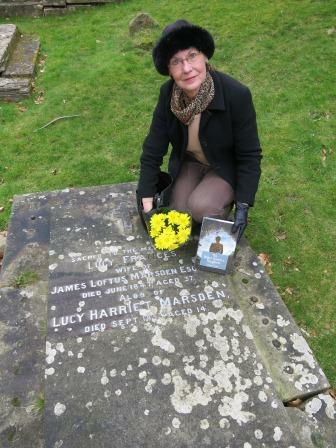 I also went back to the churchyard to revisit the grave of Lucy Marsden, who died in September 1853 after being brought home from Paris. She is buried beside her mother, John Rashdall’s sister, who had died during childbirth in 1847. 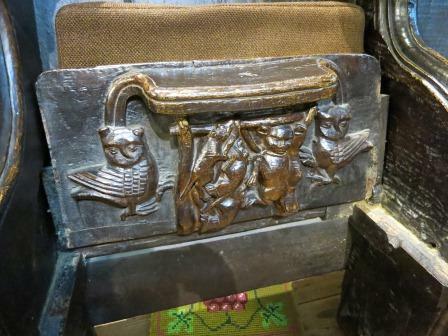 Inside the church is a carved 15th century misericord seat, which somehow symbolizes the Paris trials. The owls represent the wisdom of the judicial system . The victimized mice hanging the cat can be viewed as the surviving Marsden girls, wreaking justice on their tormenter. But who does the cat represent ….Mlle Doudet, their governess or Dr Marsden, their father? Readers of the book must make up their own mind. I am delighted that the launch is to be hosted by the Malvern Book Co-operative, an innovative , community funded venture. The friendly staff not only sell books, but coffee and home made cakes, a heavenly combination in my opinion. Congratulations, Pauline. I wish I could be there, but with a few thousand miles between you and me, it will have to remain an unfulfilled wish. 🙂 All the best to you on your big day. Thank you so much Diane, I wish you could be there too! It’s all very exciting. The support from people in general but especially in Malvern is really heartwarming. Thanks so much Vikki. I couldn’t have picked a more perfect venue than the Foley Arms so it should be great.